Though Ramanuja Darsana known also as Ubhaya Vedanta takes the Tamil hymns of the Azhwars as seminal works for practical application, Sri Ramanuja’s own commentaries avoid quoting from them. The reason is clear, says S.S. Raghavachar, eminent scholar, underlining the shrewdness of the Acharya in taking up only those texts that had been used by the philosophers whom he was contradicting to establish the Visishtadvaita Siddhanta. Ramanuja Darsana contains rich content, the richest of them being the delineation of the path of devotion and surrender. Help to walk this route comes not only from ancient Sanskrit texts but also from the Sanskrit, Manipravala and Tamil writings of the Srivaishnava acharyas. But most of all, from the mellifluous Tamil hymns of the twelve Azhwars anthologised as Nalayira Divya Prabhandam. But then, bhakti was born in Dravida land! 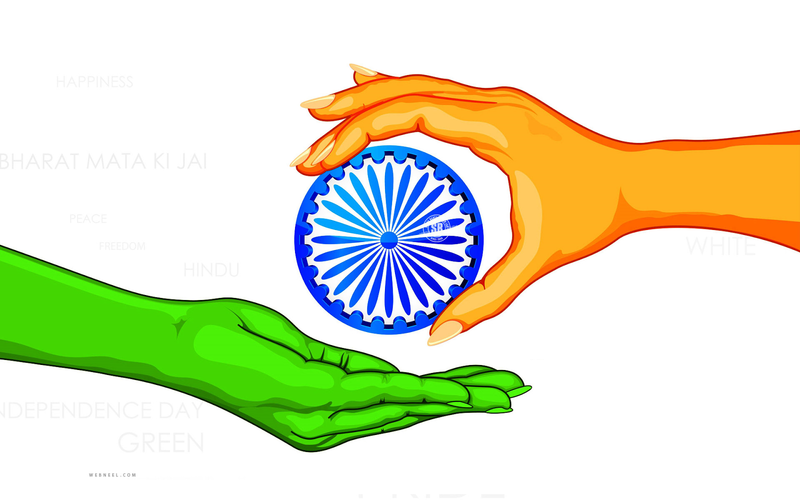 While India’s religion and spirituality prospered in brilliant shades in Sanskrit, it was in the South (of the Vindyas) that man was brought very close to God. The distance between the deity and the devotee was completely eliminated when Periyazhwar saw the Supreme as a babe in the cradle. Since music was an integral part of Srivaishnava devotion, Nadhamuni arranged for the rendition of the Tamil hymns in Srirangam temple, thereby giving a scriptural elevation to the Tamil language. The Supreme is himself a musician! 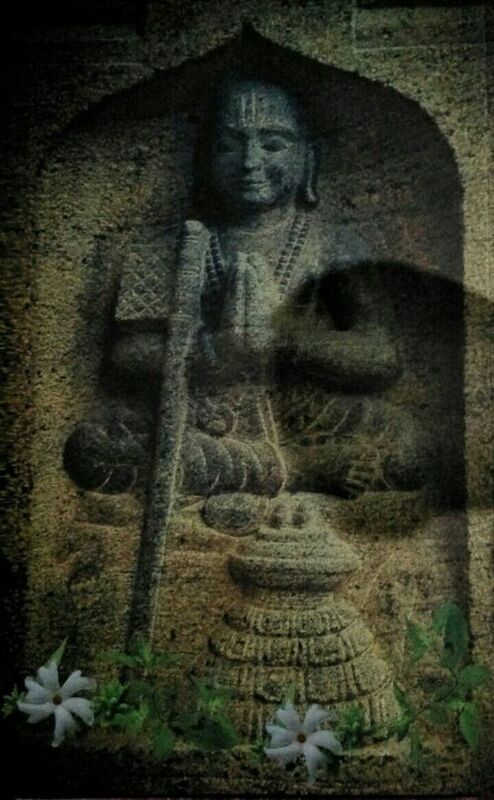 We have the immortal description of the Flute-Player of Brindavan by Periyazhwar (Periyazhwvar Tirumozhi, 3-6-8). It became obvious to Sri Ramanuja, as he was managing the Srirangam temple, which already had the custom of singing the Tamil hymns in the presence of Lord Ranganatha, that here was a treasure-trove for spreading Visishtadvaita. These works should be explained and taught to the devotees in the same way as the Sanskrit texts, entwining both in the process. This twin-language formula became an integrating factor. The Acharya lost no time in instructing his disciple Tirukurugai Piran Pillan to write a detailed commentary on Nammazhwar’s Tiruvoimozhi, hailed as Tamil Marai (Tamil Veda). Beginning with this Aarayirappadi of Pillan, the tradition of writing Manipravala commentaries on the hymns of the Azhwars reached its zenith in Periyavachan Pillai and the last movement is marked in the golden sunset of Vedanta Desika’s commentaries. The North-South divide was gone and our great integrator himself attended many of the discourses. T.V. Gopala Iyer identifies at least 37 places in the commentaries as Sri Ramanuja’s own interpretations. 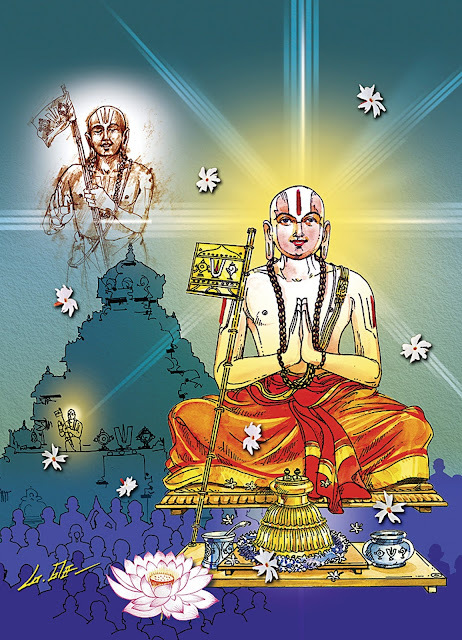 Even as he learnt the verses from his teachers with detailed explanations, Sri Ramanuja realised the great potential the verses had to connect people and keep them united by the bonds of bhakti. He was a great traveller who took hundreds of his adherents on these pilgrimages all over India with the accent on the temples consecrated by the verses of the Azhwars. There are soul-stirring recordings about these travels which helped the spreading of Ubhaya Vedanta either through dialectical argument or devotion-filled music. The aspirants with him also gained a sense of freedom being away from the mundane worries of home and work, and thus experimenting with the sadhana of meditation in the corridors and nandavanas (gardens) of temples. 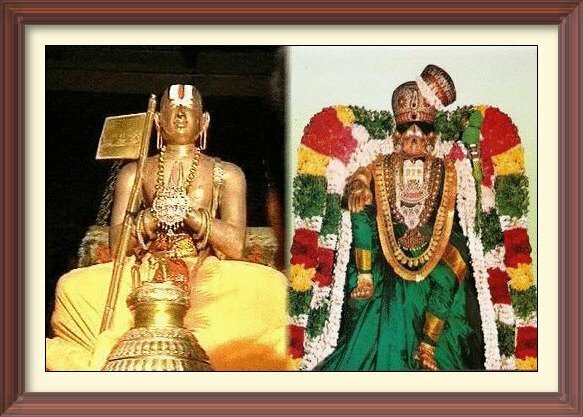 Whether in Kurugur or Srivilliputhur or Azhagar Malai in South India where grand festivities went on in the temples, or Krishna Janmabhumi, Mathura and other temples in North India badly mauled by invadors, Sri Ramanuja helped his entourage take in the divinity of the place with the help of Krishna enshrined in their hearts. The sad sights only helped in strengthening his resolve to re-steer the people to the path of devotion. It was no easy task, the building up of the psyche of the common man who had seen the destruction of his temples and sacred groves. The Tamil hymns gave the answer. He is in the heart - Manaththullaan! As long as the heart did not lose faith, all would be well. For the Lord is a flame within us activating our works, and a simple verse in one’s own mother tongue will give the strength to draw us close to the Divine. All are deva bhashas in this regard! 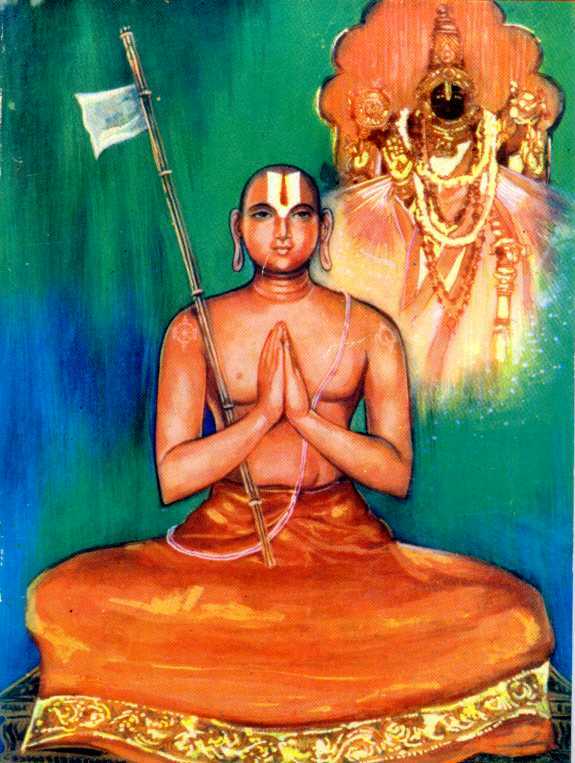 Sri Ramanuja’s move to go around reciting the Tiruppavai verses of Andal (he was called Tiruppavai Jeeyar) ushered in the flowering of bhakti literature in all the Indian languages, a trend that has continued till the present day.